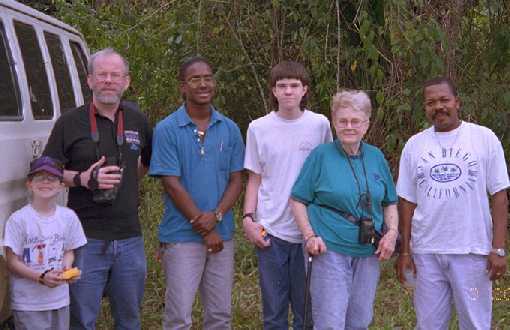 We travelled in Belize, Central America, for two glorious weeks during Christopher's March 1996 school vacation period. Belize is a British Commonwealth country known as British Honduras before independence. Belize has the second longest Coral barrier reef in the world (only the Great Barrier Reef in Australia is longer), and has extensive rain forests that are still in pretty good shape. We flew Continental direct from Boston to Houston, where we met Robert's aunt Mrs. Vivian Simons ("Vetta" to us), a legendary intrepid traveller. We flew down to Belize City, waited a while, and took a Maya Airlines 10 passenger puddle jumper down to Ponta Gorda near the Honduras border. We stayed overnight in Ponta Gorda. Our guide-driver took us to Blue Creek village by way of the Lubantaan Mayan ruins. We spent several days in Blue Creek village in the rain forest, observing the wildlife and foliage, and swimming in the beautiful creek. We got a ride back to Ponta Gorda, then flew to Dangriga (formerly Stann Creek Village) and were met by our hosts, who took us by boat out toSouth Water Caye, where we stayed for 8 days. Chris and I did a lot of scuba diving, some of us snorkeled, some flew kites, some watched the stars and the comet, some did nature walks and birding boat trips, and all spent a lot of time in hammocks and chairs reading and taking it easy. We met some very nice fellow travellers, and our hosts took really great care of us throughout. 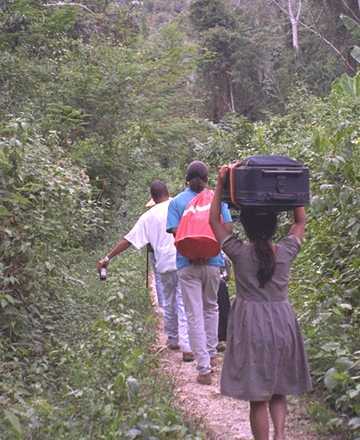 Our travel arrangements were made through International Zoological Expeditions, which owns or leases part of South Water Caye and the camp near Blue Creek village, and caters to school class research trips to study the rain forest and coral reef ecologies, as well as handling adventurous family and individual travelers. This was the most thoroughly documented trip we have taken. Robert shot about 8 hours of raw video footage and shot a roll of film on almost every dive, and Ann and Vetta both shot many rolls of film. We hope to turn the best stuff into web pages here over time. So far we have just done some of the diving pictures, in a diving section linked above. Contact robert@wellscs.com | Updated August 20, 1996.